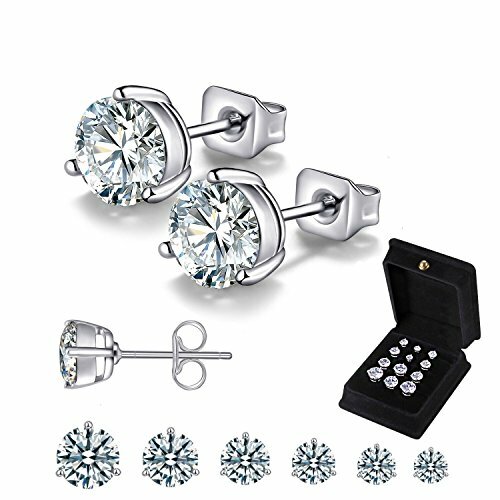 Anni Coco 18K White Gold Plated Stainless Steel Brilliant Cut Round Clear CZ Stud Earrings, 4-9mm 6 Pairs | What Should I Say? 10 mm 316 stainless steel needle, perfect length for most of your ear. Well polishing and 18K white gold plated, good choice for sensitive ear. Multiple sizes offer a change from day to day, go well with any style for any occasion. Or share it to your close friends. These stud earrings will work perfectly as a gift for women or man. Also a beautiful piece that complements your personal style. Each earring comes with a steel butterfly earring back, easy to adjust, convenient to put on and take off. Avoid the Earring contacting Lotion, Hairspray, Makeup, Powders and Cleaning Agents. Clean with the Clear Water, Wipe Dry with a Soft Cloth. For the small parts, don't swallow. This product contains desiccant, beware children swallowed. Promise 90-day exchange or money back guarantee, welcome to contact us with any question. [METAL] 18K White Gold Plated 316L Stainless Steel, More Antioxidant; Safe Material, Great Piercing Jewelry for Sensitive Skin, Hypoallergenic. If you have any questions about this product by Anni Coco, contact us by completing and submitting the form below. If you are looking for a specif part number, please include it with your message. Solid 14k Yellow Gold Baby ID Bracelet with Religious Cross, 5.5"